Remember when Porsche purists were beside themselves when the maker of the 911 said it would make an SUV? Oh, how they moaned. 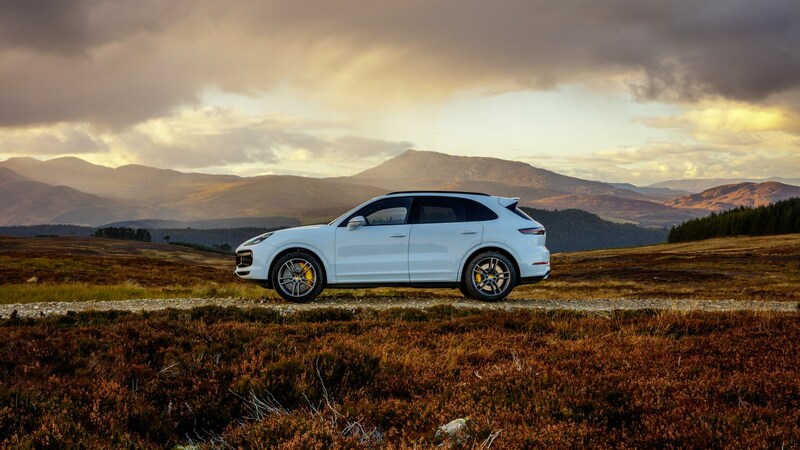 Before the Macan arrived, it was the Cayenne’s blitzing success that brought Porsche back from the brink and on to become one of the most profitable names in the business. This new one, then, has a lot to live up to. We’ve driven it on UK roads in feisty Turbo spec, priced from £99,291. It’s still not a looker, is it? Nope, but when has the Cayenne ever been ‘pretty’? This Turbo particularly looks like a catfish that swallowed an elephant, as that gopping grille is accentuated by the white paint and black trimming around the edges. It’s almost reminiscent of a Glasgow Smile. Yeesh. Still, it’s arguably better resolved, design-wise, than the previous two generations. It looks more like a model of car in its own right, rather than ‘just a 911 on stilts’. The rear end particularly looks more purposeful, as Porsche seems to have ‘done a Panamera’ to the Cayenne’s booty. A thick, lightly-tinted light bar stretches across the whole tailgate and four purposeful exhausts are your portal to the burbly V8 that lies a few feet further forward. Oh, and that rear spoiler? It’s active – the first time an SUV has come with one, according to Porsche. 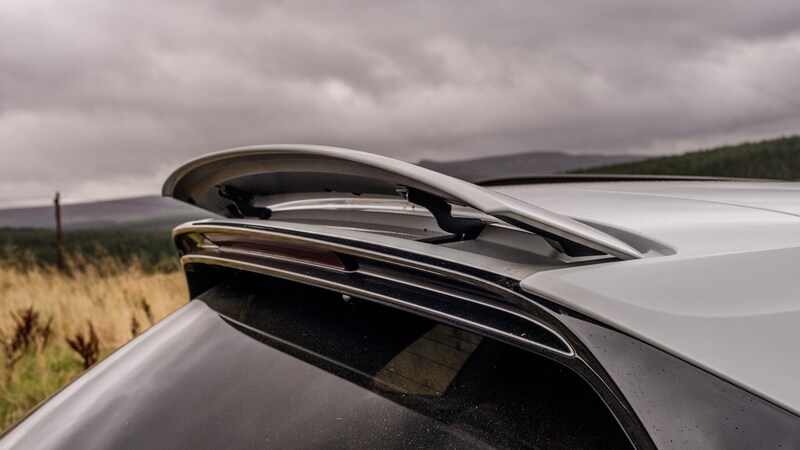 A sizeable flap lifts out of the spoiler housing, which raises and lowers depending on which performance mode the car is in and can even act as an airbrake when it’s fully deployed. Cool. Any other clever tech? Oh, that’s just the start. The familiar shape and styling hides a lot of tweaks, revisions and all-new kit underneath. Like its Q7 brother-from-another-mother, the Cayenne has a 48V mild hybrid system taking care of the active anti-roll system, plus three-chamber air suspension (available as an option) and the use of mixed-width tyres between the front and rears, with the rears being wider for better traction. The wheelbase is also shorter than its MLB platform stablemates, the Audi Q7 and Bentley Bentayga for better handling. 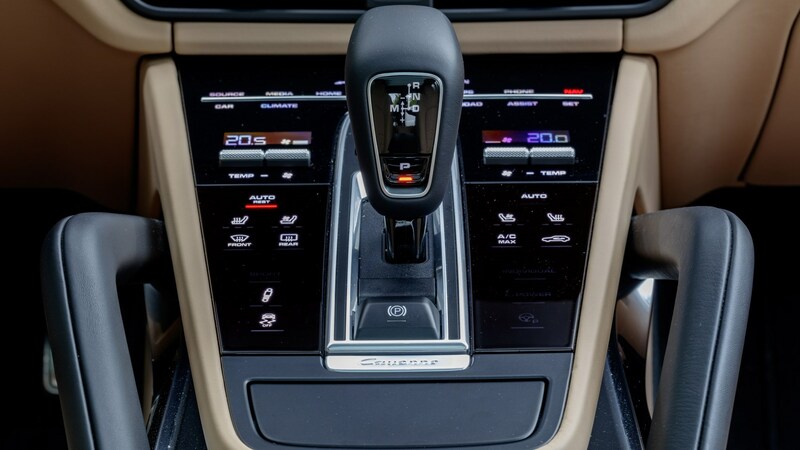 Another tech first for the Cayenne is rear-wheel steering – a piece of tech that’s wormed its way across from the 911 and Panamera, along with the Audi SQ7. This generation of Cayenne is 65kg lighter than before, as the bodyshell now uses much more aluminium, and Porsche’s new Surface Coated Brake system (standard on the Turbo, with the option to step up to full ceramics) use a tungsten carbide coating on the steel discs to reduce fade under hard braking and brake dust from heavy use. So this surely translates into good handling, then? Yup - the Cayenne is predictably a good steer when you’re out for a blast through some countryside. The 918-derived steering wheel’s chunky rim fills your palm, while the hefty weighting to the rack itself gives you quite a confidence boost. You know exactly where the wheels are pointing, even with the rears steering with you, aiding your inputs. Body control through hard cornering is seriously impressive. 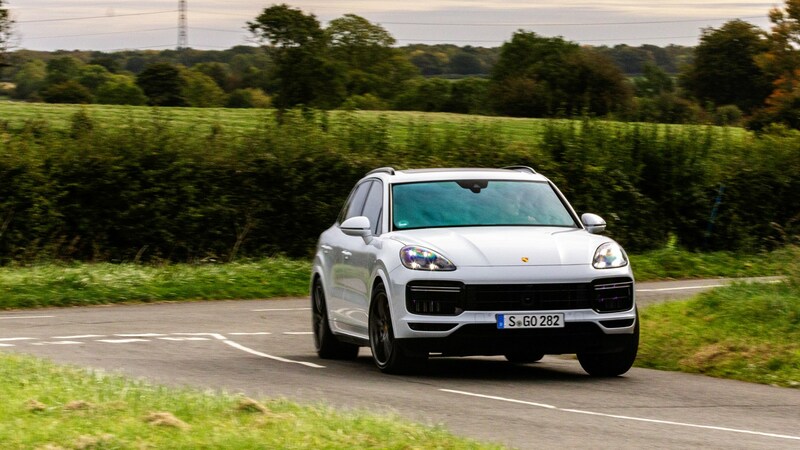 Go too hard or too fast into a corner and, for the most part, the Turbo remains almost completely flat all the way round, in spite of the Cayenne’s lofty height. Our car had the optional ceramic brakes rather than the standard ‘Surface Coated’ ones, which are full of stopping power and bite even after heavy use. It’s still a big car, though. Unlike the Macan, where that cliché of the car shrinking around you is surprisingly accurate, the Cayenne isn’t quite like that. Its vast bulk won’t make you neighbour of the year if you’re squeezing through eeny-weeny villages in the Home Counties, for example, and you’re always conscious of the car’s width when on the move. Plus, while all of the Cayenne’s handling prowess is thrilling when you’re hooning it around, the ride is fidgety on the Turbo when just plodding about. The hefty 21-inch alloys on our test car threw up all kinds of communication through the base of the seat, even when the Dynamic Chassis Control was in its softest, waftiest setting. Motorways might get tedious in the Turbo, too. Wind noise as air passes through the door mirrors is minimal and the engine is almost mute at a cruise, but considerable tyre roar spoils that. Again, this will mainly be a Turbo focused issue, as those big 21s and low-profile tyres are to blame. Mind-bogglingly so. This is still a two-tonne SUV, yet it surges forward with what feels like as much force as a 911 GTS. 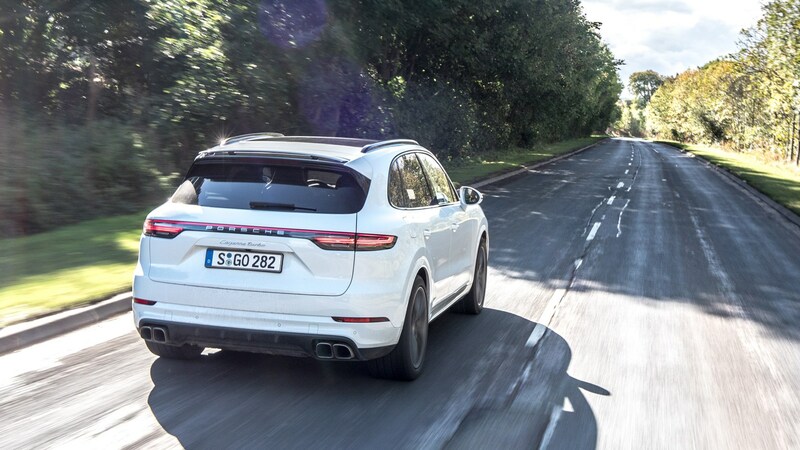 If you use the Sport Plus mode’s launch control, your Cayenne Turbo can accelerate from a standstill to 62mph in just 3.9 seconds – quicker than an Audi RS3 that’s half the size. The V8’s boomy roar will slap a smile on your face, too, and since peak power is only 800rpm away from the red line, it’s addictive to hold the gear you’re in and use the full breadth of the biturbo’d vee’s abilities. It’s a hugely capable and flexible thing. We didn’t really get a chance to take it away from tarmac during our test, but we did experience the Cayenne’s off-roading skills from the passenger seat as a preview to our drive. 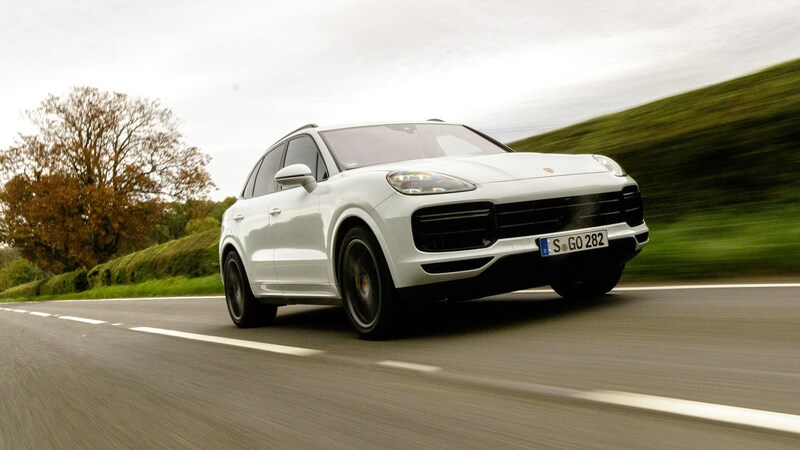 Back then, we had a go in a Cayenne S around an off-road course in Dusseldorf and the results were fairly positive. Ride control was good over properly rocky surfaces, our test car climbed one very steep incline like it was nothing but momentarily slipped on another. Frankly, if you’ve already skipped this section we wouldn’t be surprised – hardly anyone will take a Cayenne off road, despite its surprising breadth off as well as on road. How is it from behind the wheel? Much like the Panamera, actually. 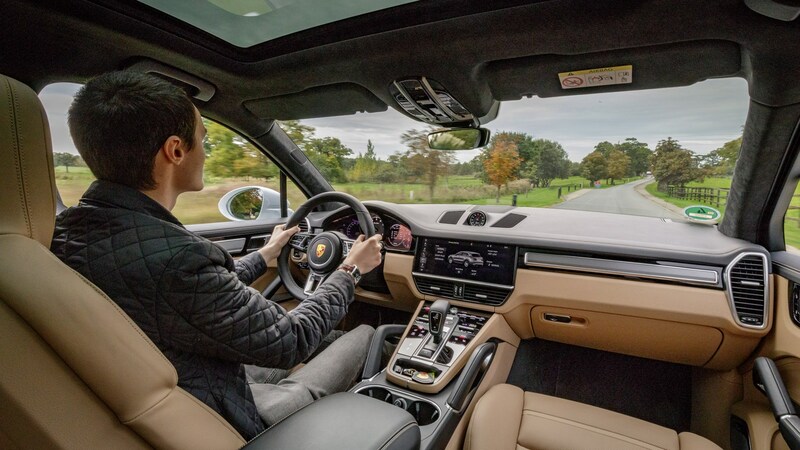 The dashboard has been largely lifted across from Porsche’s sporty saloon, so there’s a massive 12.3-inch full-HD display and a high centre console with haptic buttons instead of physical ones. There’s a chunky gear selector and some decent storage in the cabin, while an analogue rev counter is flanked by four small screens that display everything from your speed to the navigation, performance data to the optional night vision camera system. All very slick, and pleasingly solid, too. Space in the rear is plentiful for even six-foot adults, and the boot (at 770 litres) is up there with the class best. Other than the aforementioned ride and NVH issues at motorway cruising, objectively not a lot else. Subjectively, though, the Cayenne is a hard car to… gel with. It’s not as charming as a Macan Turbo, for example, so even if you go for a proper B-road blast, you get out at the other end pleased with your progress but not exactly enthralled by the experience. Capability doesn’t always translate into the fun factor. And that’s just it. The Cayenne Turbo’s breadth of abilities and jack-of-all-trades nature make it a very, very good car but not one that screams excitement. There’s tech brimming out of it, it handles superbly for such a large machine and the V8’s shove makes it bewitchingly quick, but it leaves you feeling a little cold. It’ll still find plenty of buyers, though, and what they’ll get is a genuine do anything, go anywhere machine.